So your cat has a little more to him than most cats. That’s OK – that just means that there’s more of him to love! However, your veterinarian certainly doesn’t think so and now it’s time to put your cat on a diet. More than half of the cats in the United States are obese, says Animal Planet. These cats are an average of 2 to 3 pounds overweight. That may not sound like a lot, but think about it proportionally to their size. In human terms, that’s almost like being 40 pounds heavier than they should be! That’s a lot of weight for a cat. Obesity in cats can also lead to other health issues, so it is important for pet owners to be vigilant about keeping their cat’s weight in check. How can you tell when it’s time for your cat to go on a diet? Well, if you can gently squeeze your cat’s side and not be able to feel his ribs, it’s probably time to go on a diet. Other signs would include a larger, hanging belly or a wider waistline. 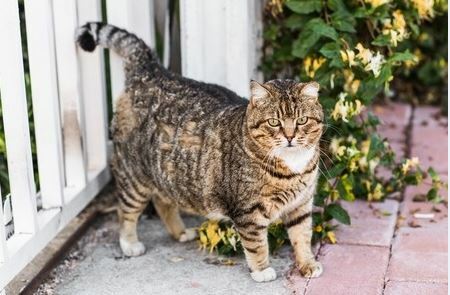 Identifying that your cat has gotten a bit chubby is one thing, but how can you get your cat to lose weight? They’re not like a dog – you cannot just take them on a walk every day – well, not easily, anyway. Fortunately that are a number of other effective methods as well. Cats should consume about 200 calories a day, depending on size and breed. Metering out the right portion size can help keep their weight managed. If your cat is able to snack and “graze” throughout the day, they will be more liable to overeating. Place out food only at meal time and put it away afterwards. Your cat needs water just like people, and offering it at all times can give you cat an alternative and fresh source to stay hydrated – and less hungry. Treats for cats are often high-calorie items – sort of like cookies, candy and other treats for people. Swap in dry food instead and you can give your cat a lower calorie option. Sharing isn’t always caring, as is the case with your food. Keep your sandwich or chicken to yourself, even though your cat may protest. Playtime is a great opportunity for your cat to exercise. Whether they’re chasing a laser, batting a toy or pursuing a jingle ball or catnip toy, playing can get them up and active, helping them shed the pounds. At The Cat’s Inn, we know that cats love to move and play, and our feline townhouses are the cat’s meow! Cats of all shapes and sizes will be able to play comfortably in our structures, whether for a stay at your animal shelter or veterinary office or as part of a pet boarding operation. Our townhouses can all house multiple cats, as well, making them perfect for feline friends or cats from the same owner. To learn more about our cat condos and townhouses, call us today at 877-228-7466.